Mindfulness is awareness of what is happening in the present moment, including awareness of thoughts, without any attachment to whatever you notice. Mindfulness is helpful because it creates space between thoughts and actions. We live in a food-abundant environment. From break rooms to advertising, we are bombarded with food, images of food, and talk about food. For some of us, these exposures set off a chain reaction of thoughts and feelings, conflict and struggle, and sometimes overeating. It's essential to realize that what you think causes you to feel a certain way. That in turn causes you to do certain things that ultimately lead to specific results. It's a chain reaction we call TFAR: Your Thoughts lead to your Feelings, which lead to your Actions, which lead to your Results. Your results reinforce your initial thoughts so they become self-fulfilling prophecies. After proving yourself right over and over again, your thoughts become beliefs. Beliefs then become automatic thoughts that drive your behaviors. In other words, habits. It's common for people to try to change the actions and results they don't like without first recognizing and dealing with the beliefs, thoughts, and feelings that led to those unwanted actions and results in the first place. If you don't like your results, ask yourself what you were thinking first. Granted, it's not always easy to recognize when a thought is driving unwanted results, especially if you've been thinking a particular way for a long time. Thinking thoughts that lead to undesirable results is a habit. Habits can be changed through mindfulness. Many people react mindlessly to their thoughts. In other words, they re-act, repeating past actions again and again, feeling powerless to change. 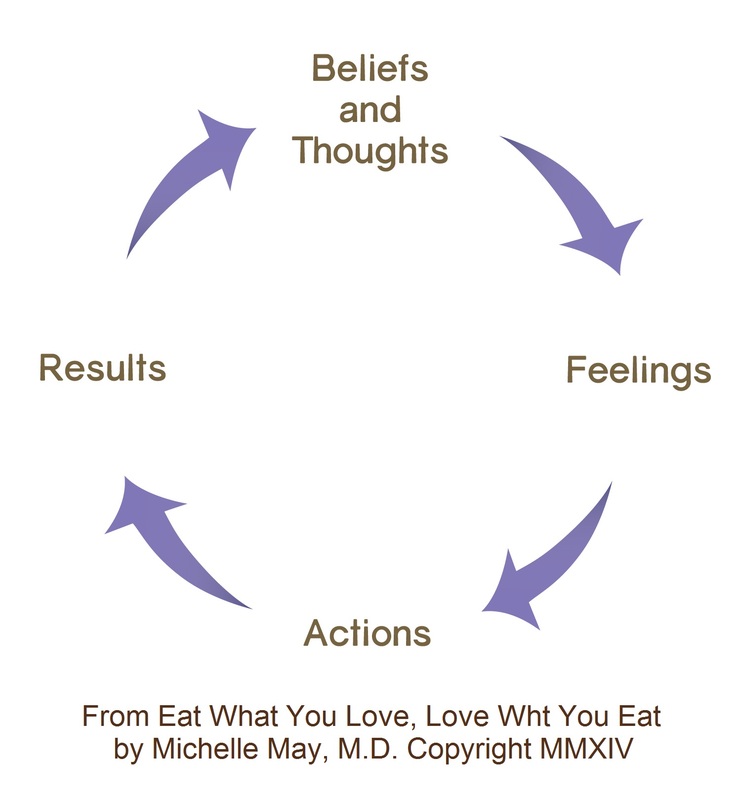 For many people, eating is a mindless reaction to their unrecognized or unexamined thoughts. However, your thoughts are just thoughts. Thinking a thought doesn't make it true or important, or require you to act on it. In fact, a thought doesn't even need to provoke a specific feeling. Mindfulness is awareness of what is happening in the present moment, including awareness of thoughts, without any attachment to whatever you notice. Mindfulness is helpful because it creates space between thoughts and actions. By increasing your awareness of your thoughts, you can begin to break old automatic or habitual chain reactions between your triggers, thoughts, feelings, and actions. Each time you choose not to activate your old trigger-thought-feeling-action-result sequence, you weaken the connections. Further, each time you choose a different action, you program new connections. With repetition, you'll hard wire these new programs so your new thoughts and responses become your new habits.